Seven towns want their residents to become immortal! Bet you never thought that there would be places where death is a crime. Well, there are. Seven cities in Italy, France, Brazil, Spain and Norway urge their citizens not to die. Sellia, Italy – The town has only 537 residents, the majority over 65. The mayor decreed that getting sick was not an option. If the residents died, it might kill the town as well. Even though the ban is not enforceable, the town government encourages its residents to stay healthy. Anyone who doesn’t get a yearly checkup will be fined. Cugnaux, France – Because there were only 17 plots left in the town cemeteries, in 2007 the mayor decreed dying illegal for anyone who didn’t already have a crypt to be buried in. The only available land for a new cemetery was on a nearby military air base. However, the defense ministry did not want the town to bury its dead there. Luckily, the defense ministry finally gave in and agreed to allow burials. Biritiba Mirim, Brazil – In 2005, there was such a shortage of space in the local cemetery that the mayor banned death. Luckily, a new cemetery opened in 2010 so people are allowed to go on dying. Lanjaron, Spain – In 1999, this town faced a grave shortage. So the mayor forbid his citizens to die until municipal officials could find space for a new cemetery. Falciano Del Massico, Italy – In 2012, this town decided to outlaw death as a way of prodding a neighboring town into letting it share cemetery space. (The neighboring town had been charging non-residents more for a plot.) As of 2014, the town was still fighting to get a new cemetery. Longyearbyen, Norway – It’s the world’s northernmost settlement and mostly a mining town. In 1950, realizing that bodies in the local cemetery were not decomposing, the town stopped allowing new burials. If you get sick and think you’re going to die, you’d better go elsewhere. If you know of another town anywhere in the world that doesn’t allow death, we’d love to know about it. This entry was posted in Estate Planning and tagged cemetery, death, diesmart, Estate Planning, funeral, Probate, trust, will on August 14, 2016 by Minna Vallentine. Do you want to stay next to your pet forever? The Virginia legislature recently amended state burial law to allow cemeteries to provide designated spaces for burying pets in caskets next to their owners. Prior to passage of the new law, cremated remains of a pet could be buried in the casket with the deceased or the body could be interred in a pet cemetery adjacent to one for humans. An example cited in an article in the Martinsville Bulletin prior to passage of the new law is Noah’s Ark, a pet cemetery, that is adjacent to National Memorial Park Cemetery in Falls Church, VA. The new measure is intended to help people who think of their pets as family members and who want them buried with them. The law specifies that pets and owners cannot share the same grave, crypt or niche and the pet section of the cemetery has to be clearly marked. Now that the measure has passed, a couple can buy three adjacent plots – one for each of them and the one in the center for their beloved pet. A few years ago, the New York legislature passed a law allowing humans to be buried in pet cemeteries along with their pets. However, pets still cannot be buried in cemeteries intended for humans. Burial of a pet with its owner after death is a topic that has spurred a lot of discussion and emotions but very few states up to now have tried to deal with this issue. For more information about end of life planning, go to www.diesmart.com. 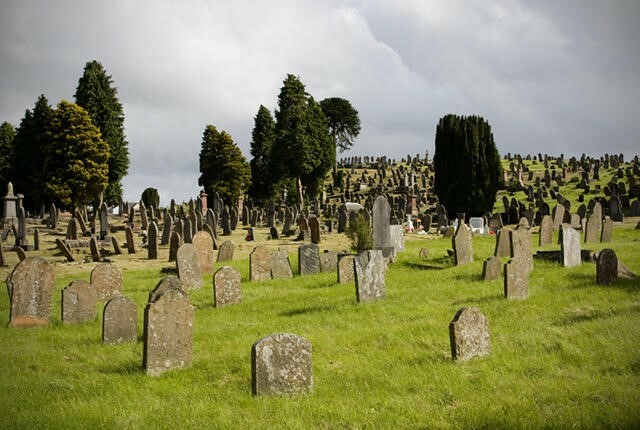 This entry was posted in Funerals, Minor Children and Pets and tagged cemetery, cremation, funeral, guardianship of a minor, pet burial, Probate, probate court, www.diesmart.com on March 19, 2014 by Minna Vallentine. You may not know when you’re going to die, but you know for sure it will happen. A little advance planning of your own funeral — or that of a loved one — can make that traumatic time when you die a little easier on your loved ones. Pre-planning funerals is getting more common as many people prefer to decide on the details of the last celebration of their life themselves. If you decide to do this, talk to your parent or spouse or other family and friends about your funeral wishes at an appropriate time, probably not during an argument or over a holiday dinner. Tell your adult children what you’re thinking about. 1. Are you thinking about a standard viewing and funeral? 2. Do you have a cemetery plot? 3. Would you prefer cremation? 4. Do you have enough money to pay for big event? 5. Do you want your death notice to read like a biography or will you be satisfied with a published statement of your dates of birth and death? 6. Do you want a video or slide show to be shown during visitation hours? Or do you want a photo board to help mourners remember earlier times? 7. Do you want masses of flowers or would prefer that money be donated to a charity instead? 8. Is there something special you want at your funeral – like your grand piano or motorcycle? All of the above comes at a cost. A funeral varies depending on the services provided. Cremations generally cost about $4,000. A burial the day after a viewing can be as much as $10,000. The cost of cemetery plots today begins at about $900, but can be several thousand dollars in a major metropolitan area. And you can spend $8,000 or more on a casket. If you decide on cremation, your ashes can be placed in an urn and then in a mausoleum, or stored or disposed of however you wish. Whatever you decide to do, if you preplan and let your loved ones know your wishes, you know that your last celebration of life will be the way you want it to be. For more information about funeral planning, go to www.diesmart.com. This entry was posted in Funeral Agent, Funeral Expenses, Funerals and tagged beneficiary, beneficiary law, burial, cemetery, cremation, funeral, Probate, probate court, www.diesmart.com on November 26, 2012 by Minna Vallentine. How about a QR barcode for a love one’s tombstone? Traditionally, the deceased have been buried in a grave which is marked by a lifeless granite tombstone. The tombstone conveys just basic information – the name of the person and his or her years of life. Sometimes it also includes a short phrase about the person, such as “beloved parent” or “lived life to the fullest”. If you’ve ever walked around a cemetery, you’ve probably looked at many of these stones and may have wished that you could know more about the people buried beneath them. Now there is technology that will enable you to learn more. A QR barcode sticker can be affixed to an individual’s tombstone. Then the family of the deceased can link the code to an electronic obituary of the person, a biography, a video or images and much more. Finally, if you have a smartphone with internet access, you can walk by this stone, scan the barcode and view the online tribute to the person. Some companies, like Digital Legacys, a Pennsylvania company, sell the QR barcode sticker and the online tribute link for $99.99 per year or $149.99 for a lifetime subscription to the service. Living Headstones®, Seattle, Washington, is a monument company. Thru them, you can buy a headstone that has an embedded QR barcode and a code link to their memorial site for $75. However, if you already have a tombstone, you can purchase a QR barcode and a link to their memorial site for $150. These QR barcodes can also be attached to memorial benches, plaques or even trees in a memorial garden. With a QR barcode, a deceased’s legacy can live on. Isn’t that better than just seeing their name and date of birth and death? What do you think? This entry was posted in Funerals and tagged beneficiary law, cemetery, obituary, Probate, probate court, QR barcode, tombstone, www.diesmart.com on October 14, 2012 by Minna Vallentine. What will happen to the poor little rich dog’s ashes? When Leona Helmsley died, she left $12 million in her will allocated to the care of her beloved Maltese lapdog, Trouble. In 2008, after some of Helmsley’s heirs protested, a judge reduced Trouble’s inheritance to a mere $2 million, saying that $12 million exceeded the amount necessary to care for the dog, even when providing her with the highest standard of care. Regulations prohibit the interring of nonhuman remains at a human cemetery. However, the Helmsley mausoleum itself is considered private property (even though it is located on the cemetery grounds) and its key is retained by the Helmsley family. Should the family will skirt the law and bury Trouble’s ashes alongside those of Leona Helmsley? What would you do? This entry was posted in Estate Planning, Funerals and tagged burial, cemetery, mausoleum, pet ashes, pet burial, pet cremation on June 21, 2011 by Minna Vallentine.